Hermit crabs typically go about their molting business below ground away from your prying eyes and nosey tank mates but this isn’t always the case. Sometimes you will find yourself with a surface molter on your hands. Surface molts can be very cool for you but additionally stressful for the crab. C. compressus surface molt. Top most leg is a newly regenerated limb Photo by Nichole Edwards. Let’s look at the best way to handle a surface molter. Second find a way to securely isolate the crab. It is extremely important that your tank temperature and humidity are in the proper ranges at this time. Do not mist a soft hermit crab, there is danger of causing an infection by over wetting the soft exo. Do not remove the shed exoskeleton (skin), your molter is going to eat that and it’s important that he does! Do not place your molter in total darkness. Normal light cycles are needed! 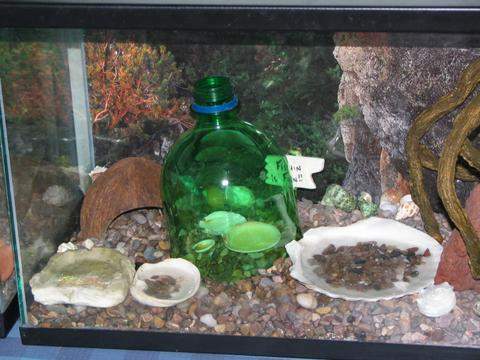 ISO bottle should be pushed all the way to the bottom of your substrate so there is no way for another crab to burrow in from below. In place isolation of a surface molter can be accomplished by cutting the bottom off of a 2L plastic bottle and then placing it over the molter and pushing it down (gently!) into the substrate, all the way to the bottom of your tank if possible. This will keep tank mates from cannibalizing the molter while it is soft and defenseless. Remove the lid from the bottle top to allow air flow. If you can’t get the bottle all the way to the bottom of the tank, keep an eye out for signs of other crabs trying to burrow their way in. If you simply can not securely isolate the surface molter, you may be forced to move them. You need to have some sort of container ready, preferably something that can stay in the same tank where the molt has occurred. Very small kritter keepers are ideal for this as they have secure lids but are vented for air flow. As gently as possible move the molter AND the shed exo to the isolation container. Do not poke, prod or otherwise futz with the molter. When the molter begins moving around on his own you can gently move him from the 2L bottle enclosure to a larger isolation tank stocked with food and water and a hut. When your molter has fully hardened up it’s time to go back to the main tank. Monitor the molter and the tank mates for signs of aggression. If you witness ongoing aggressive behavior, place all crabs upside down in your water pools. This will rinse off the molting scent and everyone will smell the same again. Unless there is a problem, bathing is UNNECESSARY and should not be done. Aggressive behavior is an indicator of a bigger problem, usually over crowding or inadequate diet. I understand that it is very fascinating to be able to watch the molt process happening but remember your presence is threatening to the hermit crab at this time. If you want to take photos, do NOT use the flash! Limit your photo taking and time spent hovering and try really hard to let your poor little crabbie do his molting business in peace and quiet.